Scientific attentions have been recently drawn to functional foods consisting of biologically active components. Probiotics are one of the food components exerting beneficial health effects by balancing the microflora in the intestinal environment when consuming in an adequate amount and manufacturing of probiotic products, especially fermented dairy ones raised. In order to achieve health claim of commercialized probiotic products, enough quantity of each probiotic strain is essential. However, poor viability and high susceptibility of probiotic bacteria to the environmental conditions have encouraged food researchers to investigate various methods to enhance minimum viable numbers of each probiotic strain in probiotic products. Recently, using herbal extracts and essential oils in yogurt and fermented milk as new trends in order to improve the viability of probiotics has been taken into consideration. 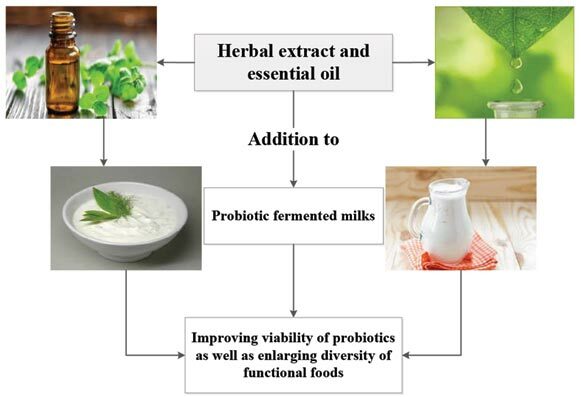 In this article, the importance of probiotics as functional food ingredients and the impact of extracts and essential oil from different sources on the viability of probiotic fermented milk are reviewed. Functional food, probiotic, viability, herbal extract, essential oil.